I did not use muffin trays. 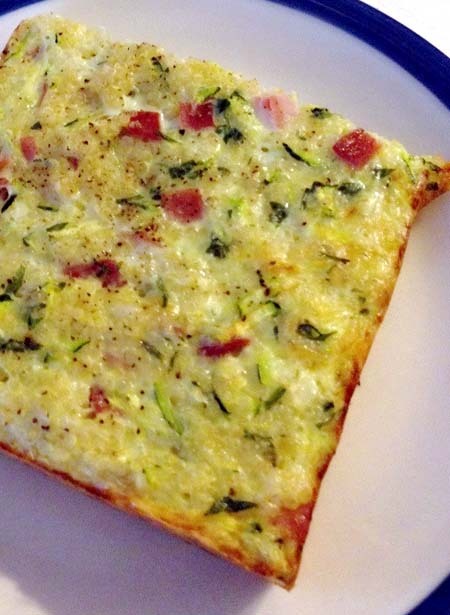 Instead, this frittata was made in a 4x8 baking pan. But the recipe and direction was followed closely. 1. Preheat oven to 400 degrees F (200 degrees C) and grease baking pan. 2. Bring the quinoa and water to a boil in a saucepan. Reduce heat to medium-low, cover, and simmer until the quinoa is tender and the water has been absorbed, 15 to 20 minutes. 3. Combine cooked quinoa, eggs, egg whites, zucchini, Swiss cheese, ham, parsley, Parmesan cheese, and white pepper in a large bowl and mix until thoroughly combined. Pour onto baking pan. 4. Bake in preheated oven until the edges of frittatas are golden brown, about 30 minutes. Allow to cool at least 5 minutes in the pan before serving. Serve hot or cold. I just realized that replacing ham with a vegetable, perhaps mushroom, tomato or onion, then this recipe would be vegetarian. Between the quinoa and the eggs, this frittata should provide plenty of protein.